Do You Believe Learning Can Be Fun? Are you one of those teachers/parents who question whether school can actually be fun? If so, sadly, I would put you in the majority. For some reason, the idea that learning can be fun seems to escape most teachers I talk to (teachers at home or in classrooms). It’s as if we’ve come to associate learning and drudgery, education and pain. So after homeschooling for the better part of thirty-five years and helping other homeschool families for at least half of that time, I guess I shouldn’t be amazed by how many people don’t incorporate games into their homeschooling packages. When Do You Use Games? But, maybe it’s time to reevaluate what we consider as “real school.” My proposition: If learning is taking place – education is in effect. And education counts as “real school,” even if it’s outside the scope of a packaged curriculum. If learning is fun, we have less resistance, our students want to continue it longer, and they will retain more of it. So where, exactly is the problem with any of that? Maybe because it takes us away from our comfort zones of lesson plans, “canned curriculum,” and tests. But maybe that’s exactly what we need to be doing. Too often we think of games as merely entertainment or the reward for completing the required schoolwork. But as I said, my contention is that games can and should be a regular part of our educational packages. We need to look more seriously at the “non-schoolish” things that can comprise the various elements of how we educate our children. Those elements should include hands-on learning when feasible and games can make up a unique part of that type of learning. Games often stand alone in their ability to combine fun and repetition with learning. The best games also bring family members of various ages and abilities together in ways that canned curriculum will never do. Once you have started thinking of games as valuable ways to expand the education of your children, you should start to see games and game ideas in a variety of places. You may want to start by relooking at the games your family already owns. Have you ever stopped to consider the educational value of games like Monopoly, Yahtzee, and Scrabble? Most of us have owned those games for years, but how often do we break them out as part of school? Sadly, not often enough. Consider the games you already own according to the rules they came with, but also try to look at them in a new light. How many of them would serve other purposes if we tweaked the rules some or came up with brand new rules? When children are learning their math facts, dice are a great tool, and when they are learning to spell, Scrabble letters are very useful. And I have found that once we get our children thinking “outside the box” they often exceed us in coming up with new and creative ideas. And of course, beyond revising the games you already own, it can be worth taking a look at new games as well. Well-made quality games are pricier today than when I first started buying games for my family, but the next time you find an educational game you think might meet the needs of your family, but you are balking at the price, consider how much we often spend on just one textbook or teachers’ manual! All of a sudden that game, which could occupy numerous members of your family for many, many hours and help them obtain or practice a new skill, may be a great value indeed. We need to view prices as just part of the value factor and not the determining one. A very cheap game that no one likes, or that teaches little, can be a very bad use of our money, while the pricier one may prove to be the best value in your educational toolbox. Games are particularly useful for young children and students of any age with learning disabilities, but that does not mean you should shy away from them for your other, older students. A key ingredient in any learning is repetition, and a prime factor in repetition without pain is fun! Too many times we discount the importance of fun in education, and we do so at our own loss, and that of our students. Now, I’m not talking computer games or electronic games here. I will not go so far as to say that there is no educational value in any of those, but I will say that in the case of most kids, they need less electronic stimulation, not more. I’m talking about the value of card games and dice games and good old-fashioned board games. I was fortunate to grow up with two very important things in my home – lots of good books and lots of game playing, particularly cards. Consequently, my own children have grown up surrounded by both as well! At one point my children counted the games in our game collection, and we had over one hundred. (At last approximation we had over five thousand books in our home as well.) Not that every game gets played equally, but many, many of them have been enjoyed for countless hours by a large variety of people – in and out of our family. We would be lost without multiple decks of playing cards around our home. Cards are an inexpensive, portable, versatile activity. The youngest to the oldest can be occupied with them. Younger children can match colors and numbers, even with a partial deck of cards. In our family, we enjoy various card games with anywhere from one to twelve players. Most of the games we play build thinking skills and the ability to strategize. As the kids got older, some of our family favorites have included Spades, Hearts, Blackout, Canasta, and Shanghai Rummy. And nowadays you can find the rules for any or all of those on-line, so if you haven’t played them before, or don’t remember how, that is no excuse! With Chronology each person starts with a card face up in front of them, and the idea is to build your own personal timeline. 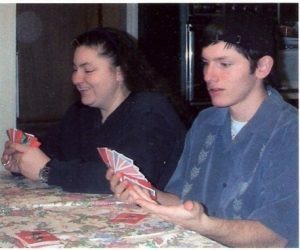 If it is your turn, the person next to you on the right takes the top card of the draw pile and reads you the event on it. You don’t have to know the date on the card, you only have to know where it falls relative to the other card you have. (Before in time? Or afterwards?) If you guess correctly you add the card to your personal timeline. Your goal is to eventually arrange a predetermined number of cards in chronological order in front of you. It’s a great way to review (or learn) the flow of important events in history, without sitting down and trying to memorize them. We liked the idea so well that we made a number of our own Time-Line games, including the History of Astronomy, Space Exploration, the American Revolution, the American Civil War, and many more. And of course, you can also make your own. You can take a timeline of any period of history you are studying with your family and make your own timeline game. You could even make one of family history, including births, deaths (if desired), marriages, and other key family dates. 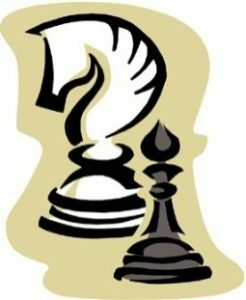 Chess is a wonderful tool to develop thinking skills. It is inexpensive, fairly easy to learn, but difficult to master. It will occupy one or more students for great lengths of time. Puzzles are great builders of both visual skills and thinking skills. Ravensburger Puzzles have been our all-time favorites, with 24 to 5,000 pieces. Beautiful pictures and quality pieces make them a real joy to put together by all ages. Larger puzzles can be put together as a cooperative effort by many family members. Some of the best games in the world come out of Germany. I was reading an article in the December 9, 2002 issue of U.S. News and World Report that discussed this phenomenon. German games topped seven out of ten of Games Magazine’s 2002 categories. German games are often more expensive – because they are so well built – but they are generally worth the investment. Our current game collection (over one hundred games) includes a number of games that we bought when we were in Germany – again, many of them from Ravensburger. German games tend to include more strategy than their American counterparts, and are generally fast-paced. Educational games can be considered part of our “curriculum package”. Retention is aided when the students are having fun while learning. Games can introduce a concept, or help reinforce an existing lesson. They do not have to be saved until “after school”, they can be part of school. Buy good games to supplement your other materials – or make your own! Or better yet, have your students make them! What a great way to reinforce learning. Games can and should be used as a supplement no matter which method(s) we primarily use. Because games are fun, and easy to repeat, and three-dimensional, they reinforce learning in a way that’s hard to replicate with other methods. I hope I have helped convince you to look at educational games in a new light. Don’t be afraid to create your own games to help your children repeat or review important concepts. And be sure to take a fresh look at the games that already exist in the market. In conclusion, strive to make learning a little more fun for your family!